Rosalie Sidoti earned her MA and BFA degrees at Massachusetts College of Art and Design and continued her graduate education for many years though a series of exchange programs with the Ruskin School of Fine Arts, Oxford University, England. She believes in the importance of teaching and mentoring and is a Supervisor for Tufts University and The School of the Museum of Fine Arts, Boston, MA. The artist is a juried member of Rockport Art Association and Museum, North Shore Art Association, where she served as a Trustee and Officer, The National Association of Women Artists, NY, MA and Oil Painters of America. Rosalie works from her home/studio in Ipswich, MA and is a National award-winning artist. Rosalie Sidoti’s work is collected by banking institutions, corporations, business and fine art enthusiasts. View more of Rosalie Sidoti on our marketplace. Porcelain and Peonies & A Look Back . Rosalie Sidoti “As a Contemporary Impressionist painter, my goal is to lure the viewer into my work using a combination of qualities that pleases the aesthetic senses. By communicating some of the story behind my painting but not all of it, I can direct the viewer into the piece and suggest just enough detail to prompt their personal thoughts and reflections. 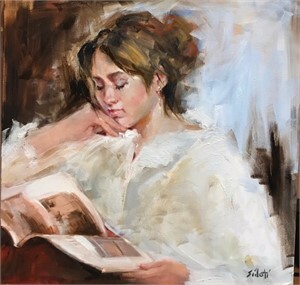 I work from models, life and from my drawings and photographs.” Rosalie Sidoti earned her MA and BFA degrees at Massachusetts College of Art and Design and continued her graduate education for many years though a series of exchange programs with the Ruskin School of Fine Arts, Oxford University, England. She believes in the importance of teaching and mentoring and is a Supervisor for Tufts University and The School of the Museum of Fine Arts, Boston, MA. The artist is a juried member of Rockport Art Association and Museum, North Shore Art Association, where she served as a Trustee and Officer, The National Association of Women Artists, NY, MA and Oil Painters of America. Rosalie works from her home/studio in Ipswich, MA and is a National award-winning artist. Rosalie Sidoti’s work is collected by banking institutions, corporations, business and fine art enthusiasts. View more of Rosalie Sidoti on our marketplace. Porcelain and Peonies & A Look Back .